Home News Latest News Outside Third Man Records: The Debut Of The Triple Decker Single! 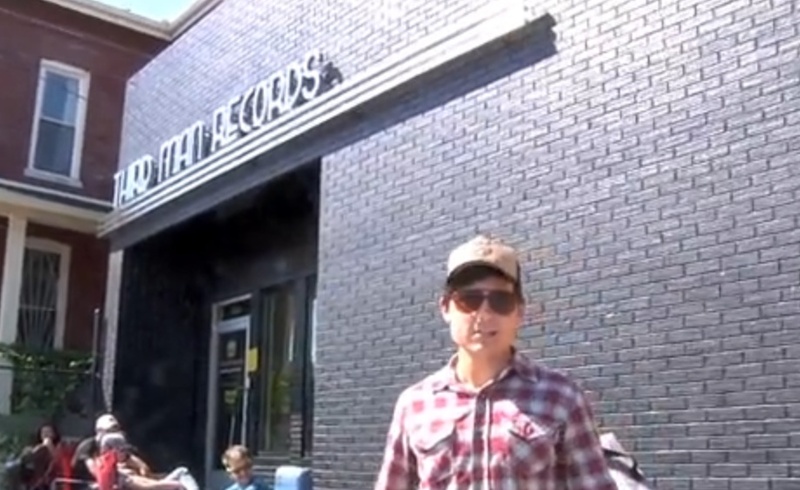 Third Man Records: The Triple Decker from American Songwriter on Vimeo. Who do you love more: Jack White or mommy? Jamie Younger and myself, Joseph LeMay, took a ride down to Third Man Records Friday to get a look at the crowd gathered at the red and yellow doors for the release of The Dead Weather’s single “Blue Blood Blues,” in the Triple Decker Record™ format, designed by Jack himself and assembled at United Record Pressing in Nashville, Tennessee. The TDR is a one of a kind 7” version of the single that’s been embedded in a 12” version. Kind of like the Double Down, which embeds a layer of cheese and bacon between two pieces of chicken… only healthier. The crowd of eager Third Man believers, some of whom had been there since 5:30……..THE PREVIOUS EVENING, kindly answered some questions for us. This is Nashville. And we love it.